Numbers can tell an interesting story, especially when the tale is a good one. Last week the Greater Coachella Valley Chamber of Commerce passed a significant milestone in the almost three-month history of the organization. The Chamber welcomed DesertWraps.com as it’s 1,300th member. The Chamber started the year with just just under 1,250 members, so to see growth through the first three months is a great story and a positive development. Perhaps the best story of all? The new Regional Chamber is growing regionally. It was significant to look and see the growth activity over the last few days. DesertWrap.com is based out of Palm Desert. Yesterday we did a ribbon cutting for Pieology, a new restaurant in Rancho Mirage. It’s great to see the new regional model being embraced across the valley. The Chamber’s goal was always to unite and harness the tremendous economic and entrepreneurial spirit of our valley business and turn it into a strong body of members pulling towards a unified goal. This week The Chamber will welcome all nine of our Valley Mayors to one stage, along with several of our local Tribal leaders for a summit focused on our valley’s economy. We were also proud to announce our recent partnerships with the Southern California Energy & Water Summit and Coachella Valley Beer Week. These partnerships and events are further demonstration that our membership is on the move, and our regional model is working as intended – regionally. About the author – Joshua Bonner is President and CEO of the Greater Coachella Valley Chamber of Commerce (GCVCC). He assumed his role in July of 2016 upon formation of the GCVCC. 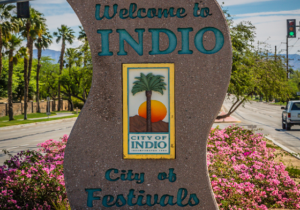 Previously he served as CEO of the Indio Chamber of Commerce. The Chamber is a business membership organization representing the Coachella Valley. We support our members through legislative advocacy, education, networking, and other community based opportunities. The Greater Coachella Valley Chamber of Commerce is a registered 501c6 non-profit supported through member contributions.